New book, 95 pages. The saw is one of the most basic tools and tends to be taken very much for granted. Many hours and much effort can be saved, and more accurate work produced, if the user has the knowledge of how his saw works and how to keep it in good condition. 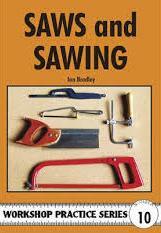 In this book Ian Bradley provides detailed guidance on the use and maintenance of all types of saw, both hand and mechanical, from the humble junior hacksaw to circular and bandsaws, in the comprehensive and succinct manner that has made him such a respected writer on workshop matters. Contents: The Wood Saw; Sharpening Saws; Circular Saw; Using Wood Saws; Hacksaw; Hacksaw Blade; Using the Hand Hacksaw; Bench-Mounted Hacksaw Machines; Power Hacksaw; Using the Power Hacksaw; Fretsaw; Power Fretsaws; Jigsaws; Cold Saw; Bandsaw; Bandsaw Brazers and Welders; Miniature Hacksaw Plans.